It's officially here you all! 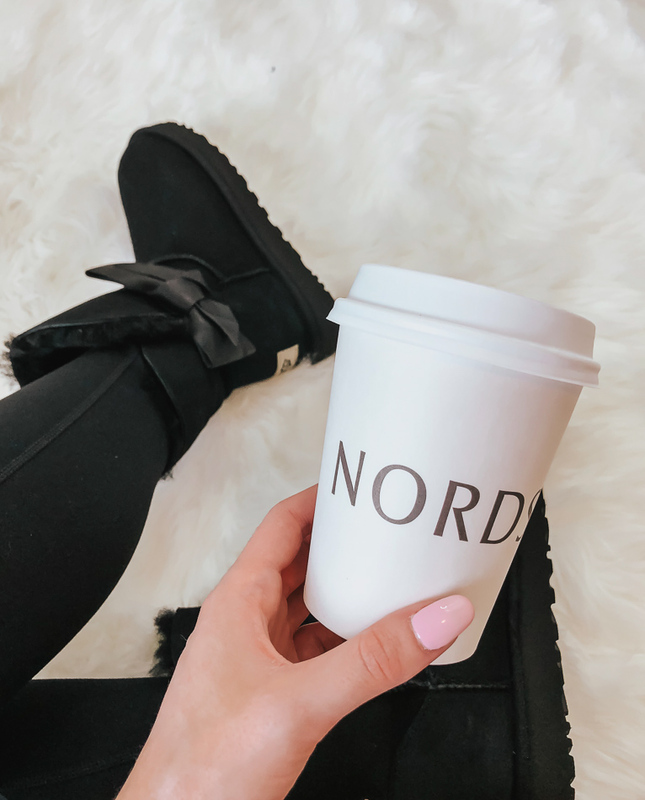 THE NORDSTROM ANNIVERSARY 2018 is now open to the public. Let the shopping madness commence (or continue haha!). 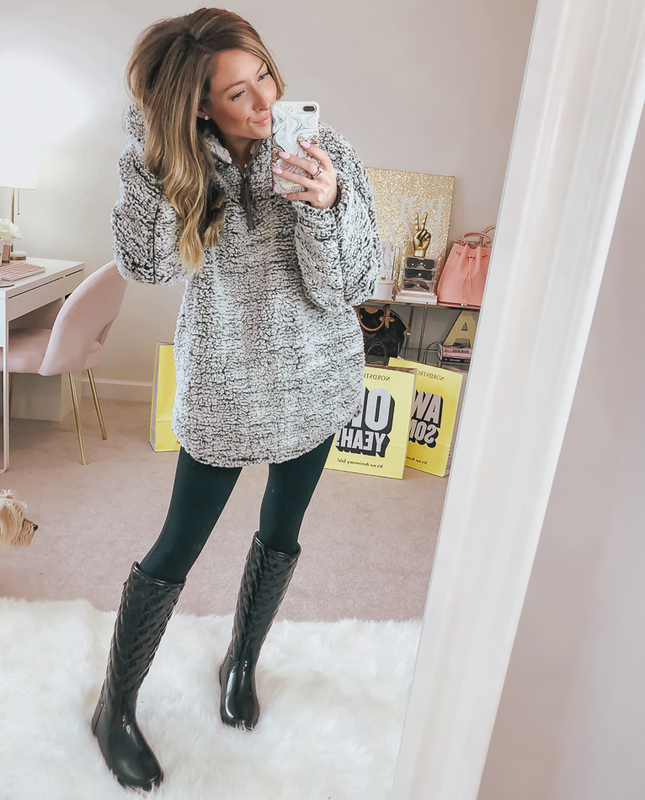 I'm so excited all of you have the chance to grab some amazing pre-fall merch at awesome prices and I'm here to share my favorites, sizing, review, and details to help you out before you shop! You can view all of MY PURCHASES HERE and can visit my sale drop down in the upper left-hand corner of the blog for more. 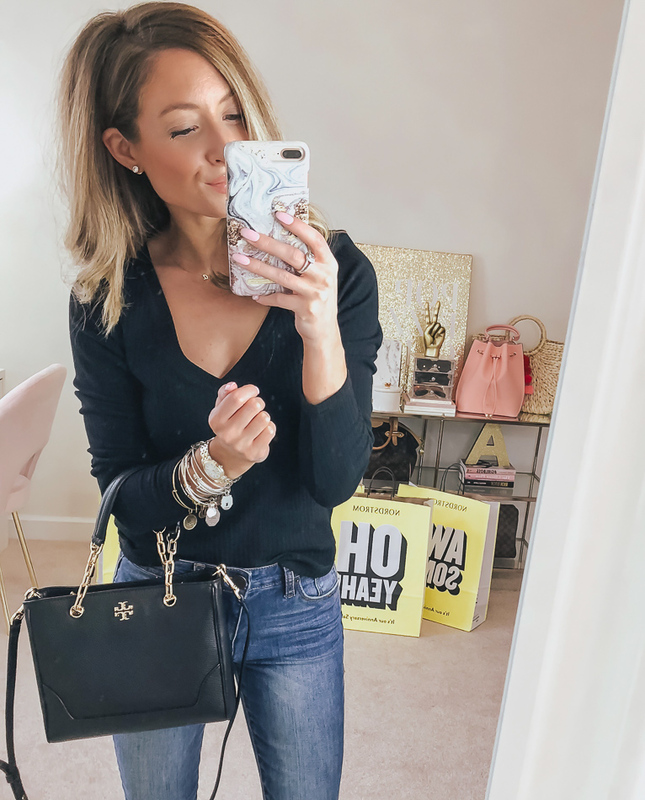 I will also list all of my Nordstrom Anniversary Sale posts thus far at the end of the post. Below you will find 20 outfits with sizing info. and my personal details. Enjoy! VARSITY STRIPE SWEATER // Runs big (wearing xxs). This sweater is incredibly comfy! If they restock it I would snag one as fast as you can. It's the perfect transitional piece for summer to fall. BLACK SKINNY JEANS // NOT PART OF THE SALE. 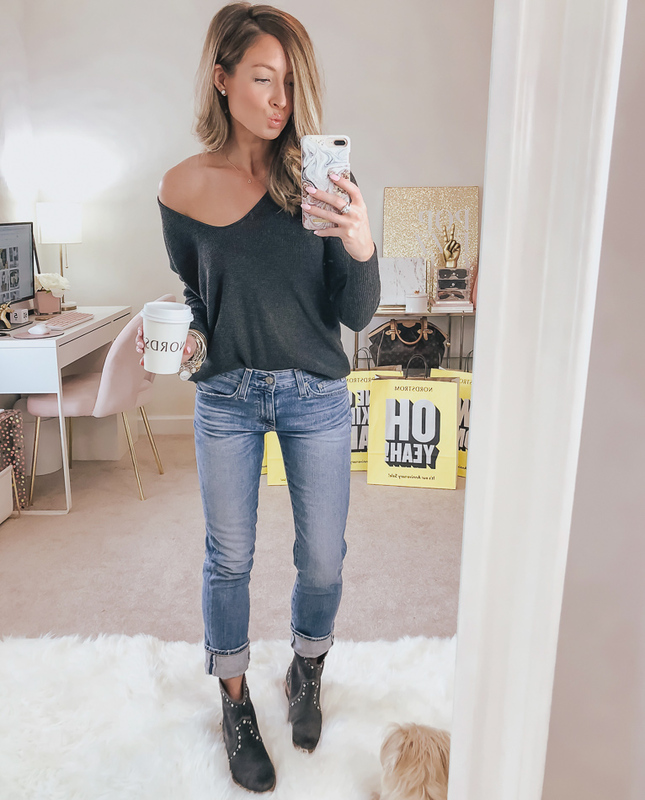 These jeans are a splurge but they are my absolute fav designer jean - I own them in white and in a dark wash too! Tts (wearing a 24). YABBA WEDGE BOOTIE (BLUSH SUEDE) // True to size (wearing a 7 with a comfy insole). I am SO happy I got my hands on these are they are one of the most popular shoes in the sale! They come in several colors (hoping they restock the blush suede) and are SUPER comfortable. SMALL MARSDEN LEATHER TOTE // LOVE! I saw this bag and knew it had to be mine. It comes in three colors with the cognac being the most popular so far. I absolutely love the black though because it looks so chic and will be perfect for my fall/winter wardrobe full of neutral colors. 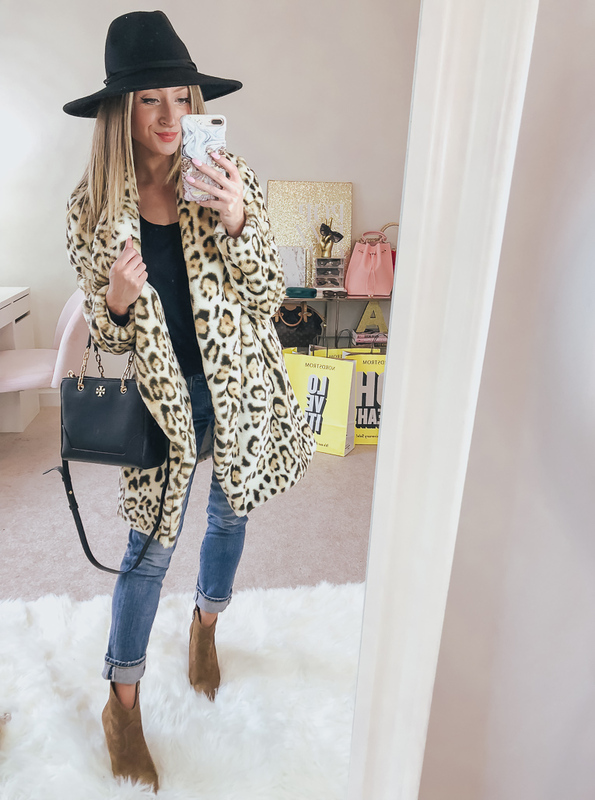 LEOPARD FAUX FUR JACKET // True to size (wearing xs). I feel like this jacket it one of the most underrated pieces of the sale. I haven't seen anyone else share it and it's AH-MAZING! It fits like a glove and you all... it's SO soft! Crazy cozy soft. I can't wait to wear this nonstop when it gets cold. RIBBED V-NECK TEE // True to size (wearing xs). 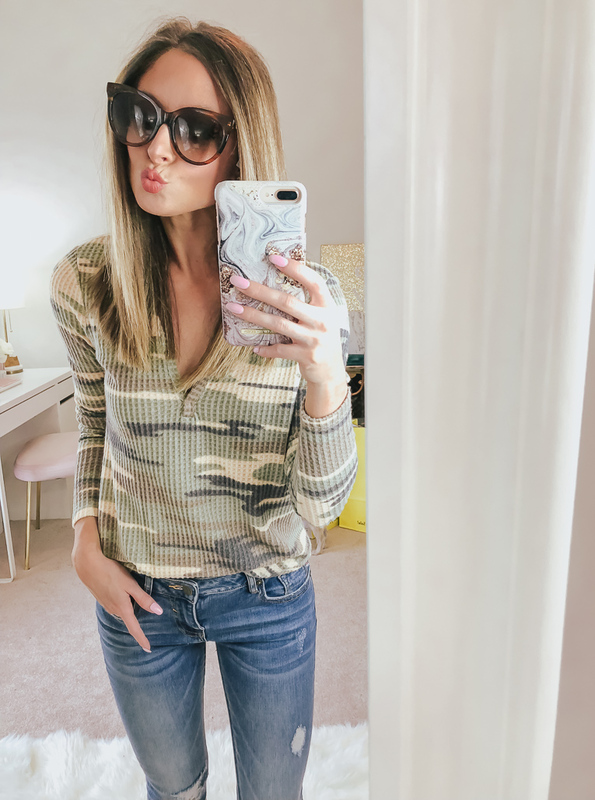 This ribbed long sleeve tee is an absolute must-buy because it's super practical and one of the best basics for the upcoming season. I bought two! 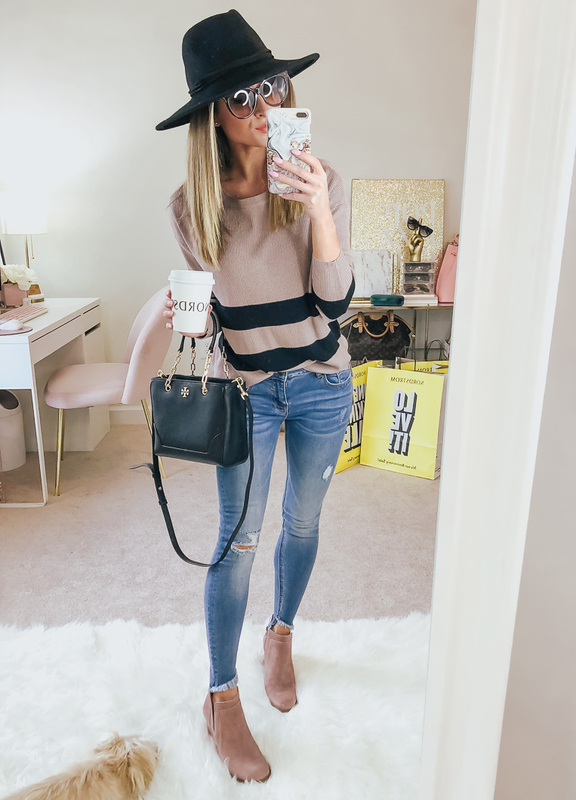 EMMA HIGH WAIST ANKLE SKINNY JEANS // True to size (wearing a 24). The Emma is a great every day, wear all the time, kind of jean. You really can't go wrong and it's great for petite! DAELYNN BOOT // True to size (wearing a 7). These are another purchase that I haven't seen anyone else with... and trust me, I follow and watch a lot of people haha! I was having bad luck trying on my Nordstrom Sale shoes and grabbed these at the last minute because nothing was working, and OMG do I love UGG boots. There's nothing like a nice new cozy pair of UGGs, especially when they have bows. I usually buy a new pair every season to wear around the house. Btw my nail polish is OPI Mod About You gel. STRIPE PULLOVER // Runs big (wearing xxs). I had a sneaking suspicion this sweater would go quick and boy did it go! Another piece I'm hoping will restock fully tomorrow because it's just too good for everyone not to have one. 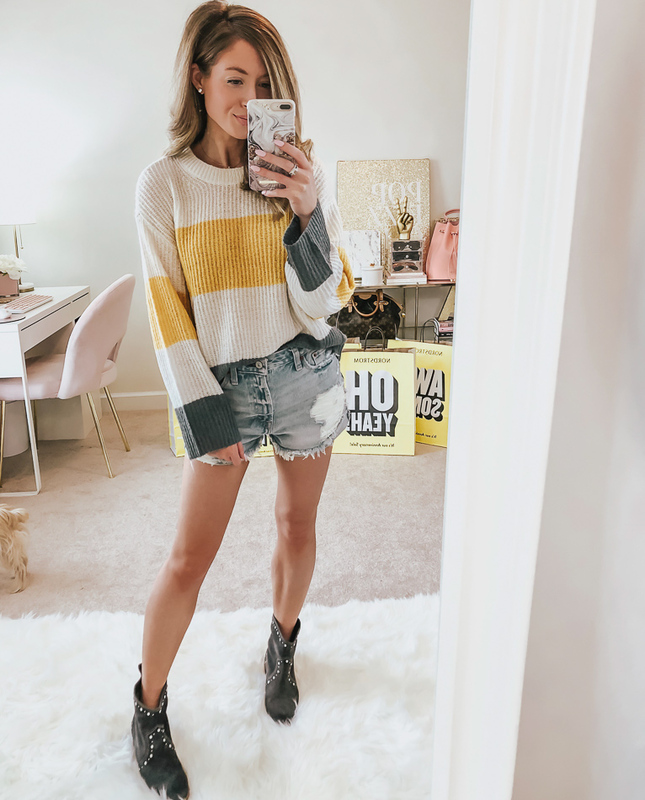 Another perfect in-between weather sweater you need in your life! DISTRESSED HIGH RISE SHORTS // NOT PART OF THE SALE but are on sale 50% off! 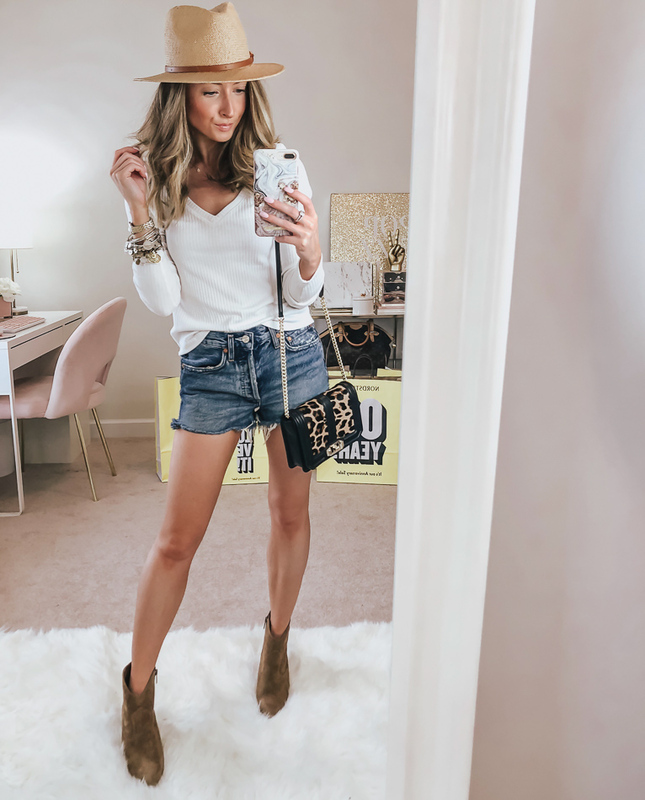 My shorts aren't part of the sale but they've been insanely popular this season and are very affordable. TOBIN STUDDED BOOTIE (ANTHRACITE SUEDE) // True to size with a sock (wearing a 6.5 no sock). Another item I haven't seen many people with that caught my eye in the sale catalog. Sizing could be tricky depending on your foot. I'm wearing a 1/2 size down without a sock but also tried the 7 with a sock and insole and they work as well. Just depends on how you plan to wear them around. TEXTURED STITCH V-NECK PULLOVER // Runs big (wearing xxs). I almost didn't buy this pullover because I didn't care for this dark grey color online, but ended up loving it in person. 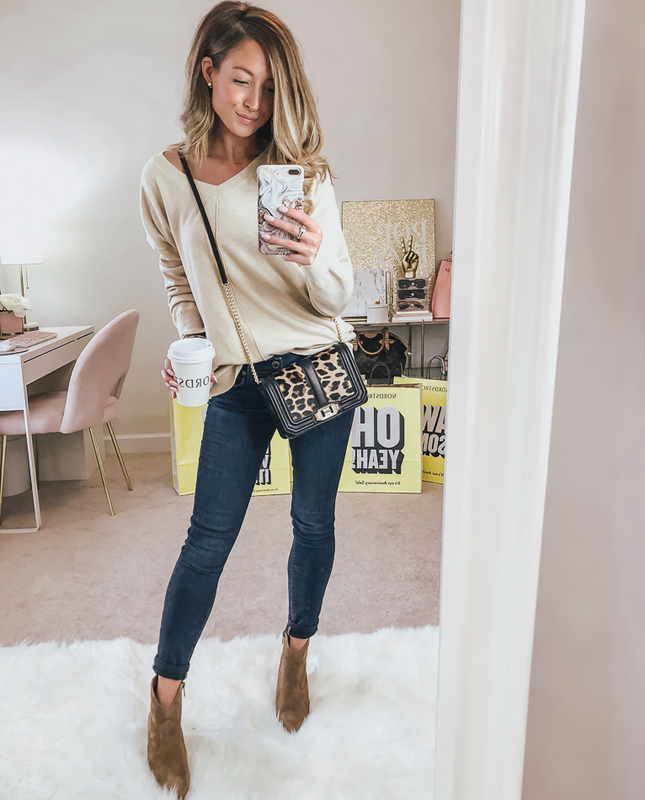 It's crazy comfy and can even be worn off the shoulder - who doesn't love a fab slouchy sweater?! EX-BOYFRIEND RELAXED SLIM JEANS // Run big (wearing a 23). BUY THE JEANS! Y'all... these jeans are SO good I cannot even express to you how amazing they fit and what good quality they are. I purchased the distressed pair last year and they've held up perfectly. Love love love! CUBIC ZIRCONIA EARRINGS (2 CT) // I just bought a third pair of these stud earrings! I own them in the 1 ct, 2 ct, and now 6 ct versions. It's a total weight split between the two earrings if you're wondering why the sizing looks different in the pictures. I wear mine almost every single day. ONE IN A MILLION INITIAL PENDANT NECKLACE // Again, I sound like a broken record, but I can't believe I haven't seen anyone share this necklace. It's absolutely precious and pairs well with other layering pieces. I looked for an initial necklace because I love mine from last year so much! TREASURE & BOND FELT PANAMA HAT // One Size (adjustable). I wanted this hat in brown so badly but I think they sold out in stores before they could ever put it online. Fortunately, a little while after the sale started I got my hands on this black one and love it now even more because it's so versatile and will match my fall/winter wardrobe perfectly. It's also easier to keep clean! MARLEY TULIP HEM ANKLE SKINNY JEANS // True to size (wearing a 24 - seem tight at first but they are super stretchy). I'm in love with the asymmetrical bottoms of these jeans AND the fact that they are actually an ankle length which is hard to find when you're under 5'4". 55MM ROUND SUNGLASSES // These little babies are definitely a splurge but I am SO HAPPY with the way they look and fit my face. 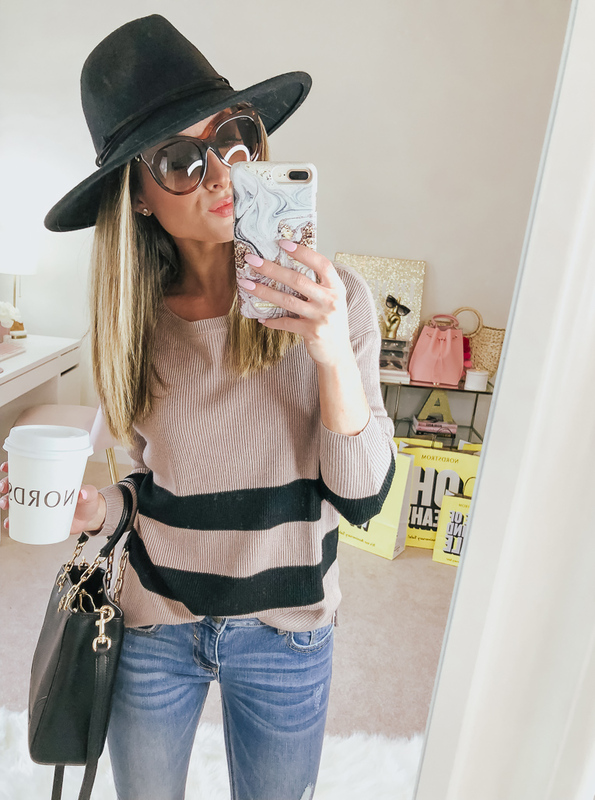 I've been looking for a second pair of must-have sunnies and love the rounded shape of the bottom and the slight cat eye at the top - really, really good quality! EXPOSED SEAM SWEATER // True to size (I sized up to a small). This sweater so far has been the most popular piece on Pardon Muah - and not surprisingly it's sold out right now online. BUT I'm typing this on Thursday and hoping for BIG restocks on Friday morning. I have a feeling they are holding out on us until the public can shop, as they should so everyone gets some fab pieces! VERDUGO ANKLE SKINNY JEANS // Run small (wearing a 25). I've owned these jeans for several years now and was so happy to see them as part of the sale. They are an awesome dark wash which makes them easy to dress up and they literally look like new after tons of washes. They have a 28" inseam making them good for petite - I did, however, have mine hemmed to hit above the ankle. MOVINTA BOOTIE // True to size unless you have a wide/big (I say that kindly) foot (wearing a 7 with a thin sock). Here's the dealio with these western-style booties. They are without a doubt one of the most talked about pieces in the sale but make note... if you never wear heels I don't know that you'll like them. The shape of the heel makes them a little bit different. For example, one of my friends found them cute but awkward to walk in, while think it's easy - they are definitely worth a try though! 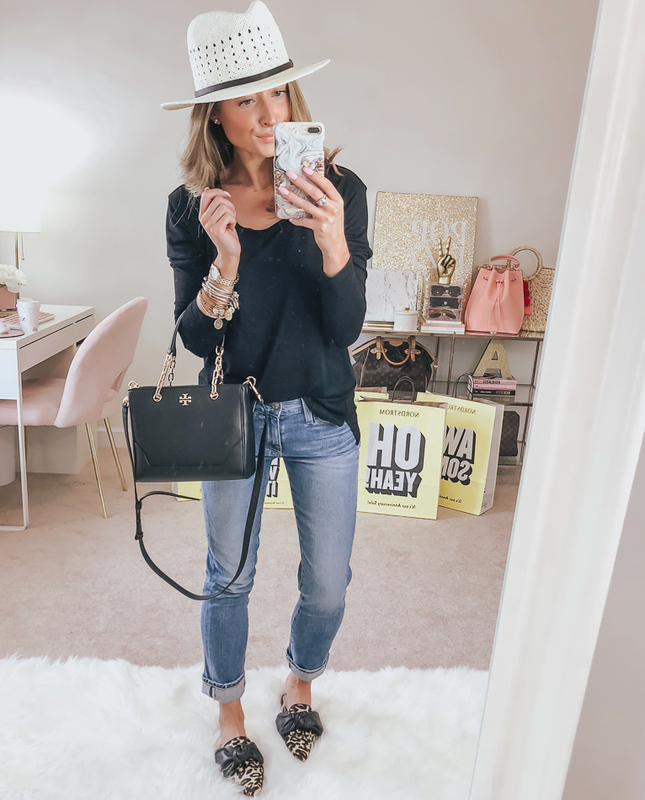 SMALL LOVE GENUINE CALF HAIR CROSSBODY BAG // I saw this bag and it was all over. All I could think was, "If I don't get that bag I'll just cry." Yes, probably dramatic but it was love at first sight and it's one of my favorite styles (I actually own it in olive too from last year). RIBBED SHAWL CACOON SWEATER // True to size (wearing xs). I'm so glad they brought this cardigan back from last year in a super similar style - it's really effortless and so comfy to wear. LACE TRIM SATIN CAMISOLE // Runs big (I usually size down in this brand). My camisole is from a different brand but it's almost identical to the one on sale. I wanted to show you how well it would pair with a simple cardi and a jean short and booties when we transition out of summer. DISTRESSED HIGH RISE DENIM SHORTS // NOT PART OF THE SALE. Run big (sized down to a 23). These shorts aren't part of the sale but they are my absolute FAV (I also own the light wash). NOVA WATERPROOF BOOTIE (MUSHROOM SUEDE) // True to size (wearing a 7). These booties are a GREAT buy! One, they are waterproof, and two they are a classic style. 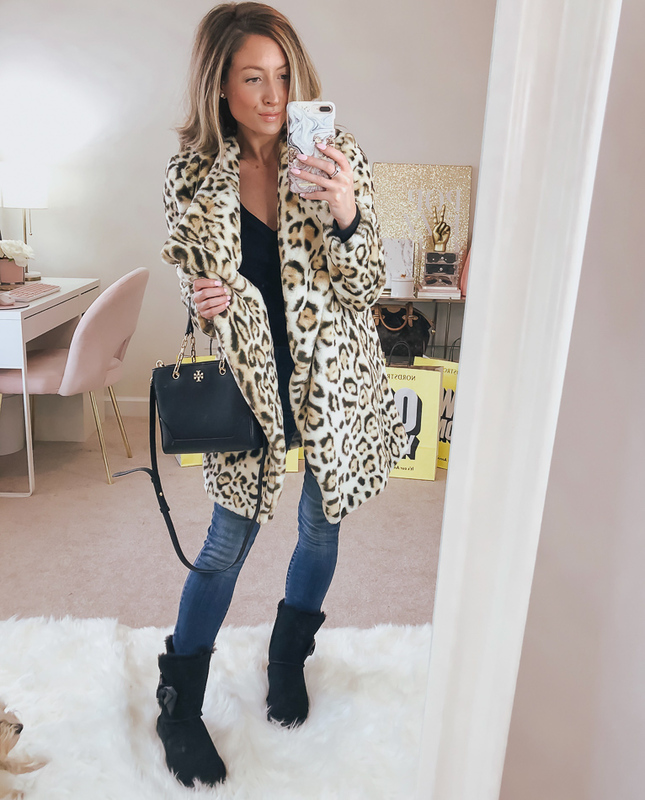 There are lots of trendy boots and booties this year which is great but it's always nice to purchase a pair that will always be in style and work well with all sorts of outfits. I ended up ordering the black too because they are so practical! PANAMA STRAW HAT // NOT PART OF THE SALE. Wearing small/medium. If you've followed me long you know I am obsessed with this hat. That's why I wanted the felt Panama hat so bad! RAW EDGE SCOOP NECK TEE // True to size (wearing xs). Usually, I size down in this brand but during the sale, I've been all over the place. I ended up getting this one true to size (gut feeling) and I'm really glad because it fits perfectly. It's made of a super soft material and comes in lots of colors. 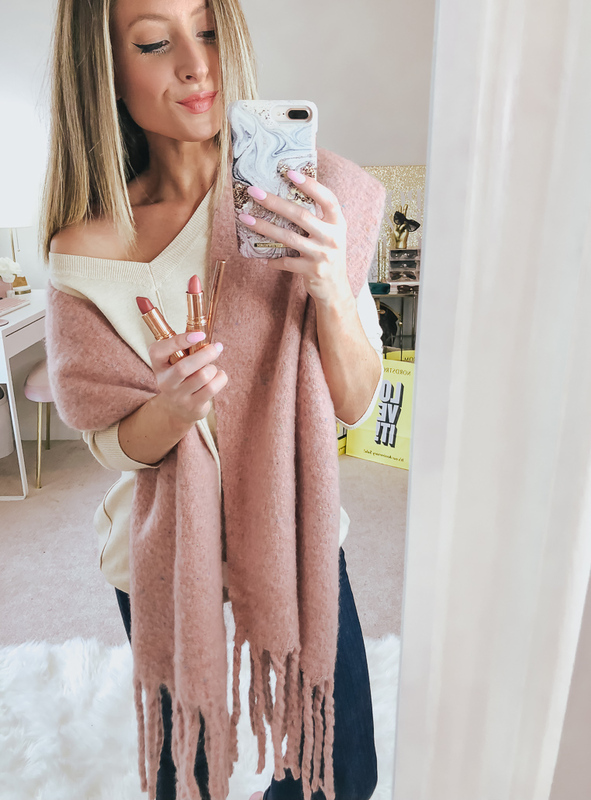 TYLER SCARF // Originally, I passed on this scarf because normally I get sent quite a few from different companies in the fall BUT after seeing it on other people I realized I've never had one like it and I LOVE the blush color. It looks like it would have wool but it doesn't, so it's not itchy. Yay! AIR HEART 51MM CAT EYE SUNGLASSES // These sunglasses are another item I somehow missed originally and then I saw EVERYONE with a pair which obviously made me want them too haha. I was drawn to them for the shape and the fact they look good on so many face shapes. They are really good quality for less than $60 - not flimsy feeling like some pairs I've tried before. WUBBY FLEECE PULLOVER (CHARCOAL) // Runs big (wearing small - that's the smallest size). One of the comfiest pieces you'll wear. Do yourself a favor and throw this baby in your cart! LIVE IN HIGH WAIST LEGGINGS // True to size (wearing xs). If you buy anything, definitely buy these leggings. I own two pairs of the mid rise, two pairs of the high rise, two pairs of the midi high rise, and one pair of the midi mid rise lol... can you tell I think they are worth it?! I love these leggings for wearing out and about because they are a thicker material perfect for cooler weather. ORIGINAL REFINED HIGH GLOSS QUILTED RAIN BOOT // True to size (wearing a 7 with shearling insert - highly recommend). My mom bought me these rain boots for my birthday earlier this year and they are seriously amazing! I ended up wearing them as both rain AND snow boots and my feet were kept perfectly dry. I love the "refined" fit because they are a slimmer cut which looks more put together if you wear them around town with leggings or jeans. And that quilted detailing! GOTTA HAVE IT V-NECK TEE // True to size (wearing xs). Well, if the color of this tee doesn't sell you, let me tell you more. Hands down the best loungewear tee (I've owned five or six) because it's nice and lightweight, super soft, and a great price point. Right now they are less than $16 on sale! FLEECE LINED JOGGERS // True to size (wearing xxs but returned for xs). I'm so glad I saw several Level 4 shoppers snag these joggers and share them before early access because I don't know that I would have looked twice. But OH! are they comfy - the inside is lined with a super soft fleece. OPEN WEAVE PANAMA HAT // NOT PART OF THE SALE. I haven't worn this hat as much as the other but I think it's fun to mix it up sometimes and this one looks better when wearing black. CELA GENUINE CALF HAIR BOW SLIDE // True to size (wearing a 7). I hope everyone gets a chance to try these because they are a Nordstrom Sale fav for good reason. There's always hype around certain items and these absolutely live up - very good quality and fit! BUY THE SHOES lol. THERMAL HENLEY TOP // True to size (wearing xs). This top was a huge surprise. It wasn't even on my radar and all of a sudden every blogger was wearing it and it looked so cute on all of them. But online it was really unappealing (sorry Nordstrom)... I unenthusiastically tried it on and to my surprise loved it so much - I can't believe I got my hands on it in store. 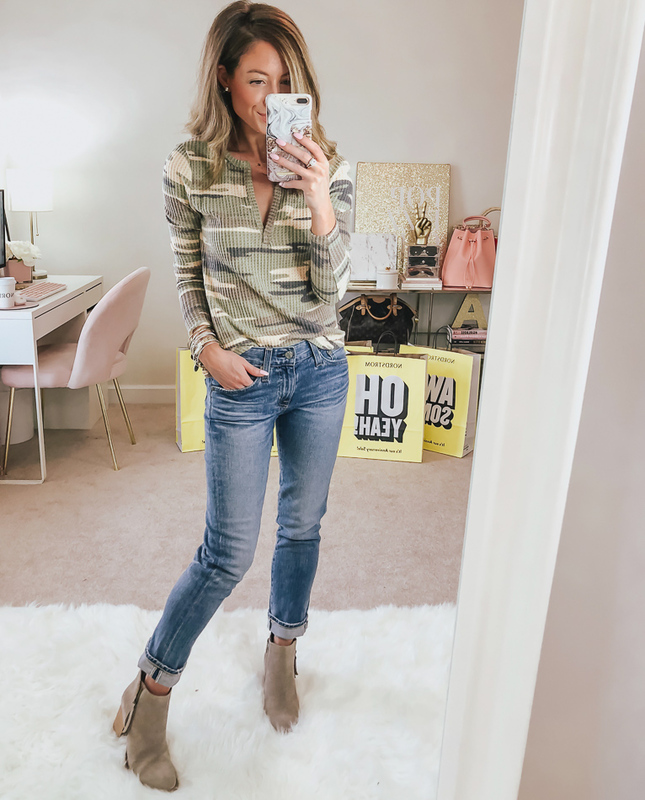 Hoping for a BIG restock on this one as it went like hot cakes in all colors, especially the camo print which is huge this season. GOTTA HAVE IT V-NECK TEE // True to size (wearing xs). Hands down the best loungewear tee (I've owned five or six) because it's nice and lightweight, super soft, and a great price point. Right now they are less than $16 on sale! 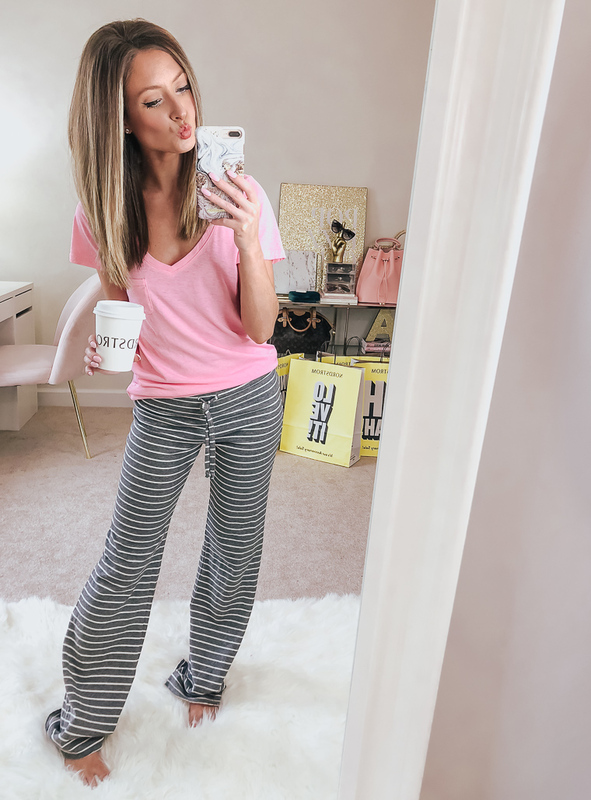 BEST BOYFRIEND BRUSHED HACCI LOUNGE PANTS // True to size (wearing xs). I've shared these lounge pants numerous times on stories because they have been my favorite for three years and I've worn mine to death. I didn't even realize how tired they were until I bought a new pair from the sale and was like, "WOW these are super soft!" I may use the others for when I spray tan now haha! STITCH HEM CURVE CARDIGAN // Runs big (wearing xxs). This is another cardigan they brought back from last year. This year's version has a slightly different shape but other than that they are almost identical. It's such a practical piece to have on hand - I reach for mine all the time! HEATHER HIGH WAIST DISTRESSED SKINNY JEANS // True to size (wearing a 24 - similar pair). 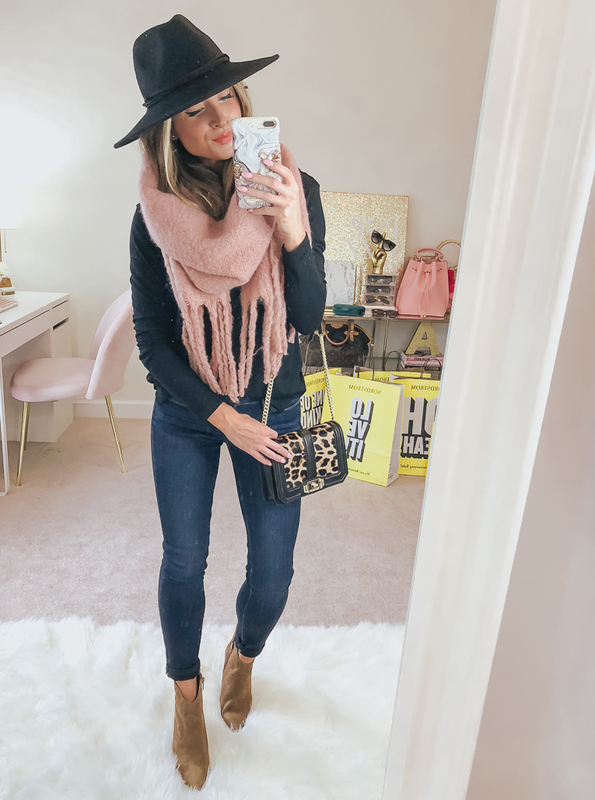 I wanted to share these jeans with this outfit because there is an almost identical pair by the same brand in the sale - super affordable and look great on a wide array of body types and heights. RAW EDGE SCOOP NECK TEE // True to size (wearing xs). Usually, I size down in this brand but during the sale I've been all over the place. I ended up getting this one true to size (gut feeling) and I'm really glad because it fits perfectly. It's made of a super soft material and comes in lots of colors. LARGE HEART HOOP EARRINGS // I haven't seen one person share these yet and they are awesome! I've been a big fan of hoops and heart-shaped hoops lately so the combo is perfect! PLAITED DROP SHOULDER SWEATER // Runs small (wearing xxs but returning for small). I love everything about this sweater (it's a great material) and I love the shape but it definitely runs small for this brand (that usually runs big). I ended up getting a small for a bit of an oversized fit and in hopes it might wear off the shoulder. Perfect for wearing with leggings when it gets cool outside. LIVE IN HIGH WAIST LEGGINGS // True to size (wearing xs). If you buy anything, definitely buy these leggings. I own two pairs of the mid rise, two pairs of the high rise, and two pairs of the midi high rise, and one pair of the midi mid rise lol... can you tell I think they are worth it?! I love these leggings for wearing out and about because they are a thicker material perfect for cooler weather. LAZY MORNINGS LOUNGE PANTS // True to size (wearing xs). I tried to get these lounge pants last year but was too late. A lounge must-have and also come in black. I love the stripes more though! RIBBED CARDIGAN // Runs big (wearing xxs). Another incredible basic. It's called a cardi but I really like it knotted in front. You could, however, unbutton it with a cami underneath for a fun look! 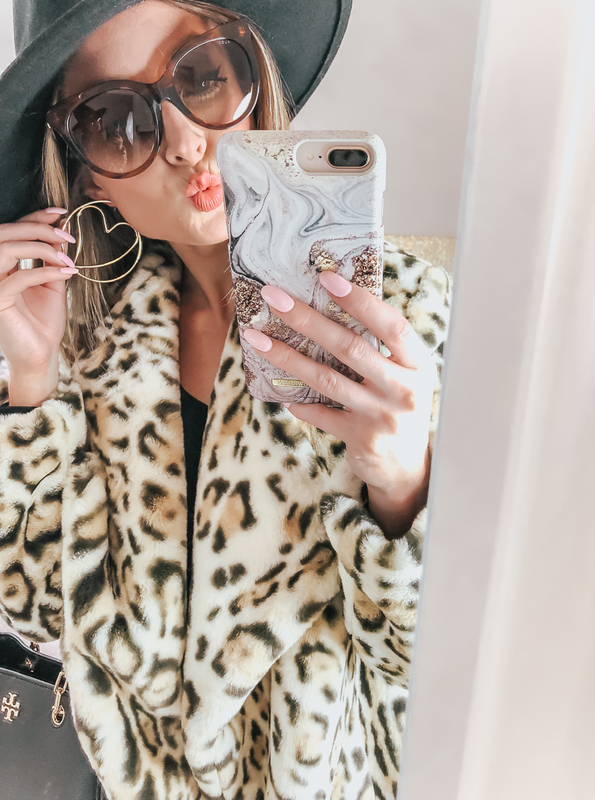 GOLDEN GLAMOUR PHONE CASE // NOT PART OF THE SALE. Since it's in every picture I wanted to link my phone case. I have several from this brand and have been very pleased. THE PRETTY PINK LIPSTICK SET // I was going to buy this lip set regardless but was really hoping I would like the colors on. I'm super picky about my pink lipsticks so it's always a gamble. You guys... it's SO GOOD! And I've been astonished at how long wearing they are. Justin actually commented how much he liked my lipstick, and they last through a barre class like nothing happened. Phew! Is anyone else exhausted?! Haha! In the best way possible I hope. 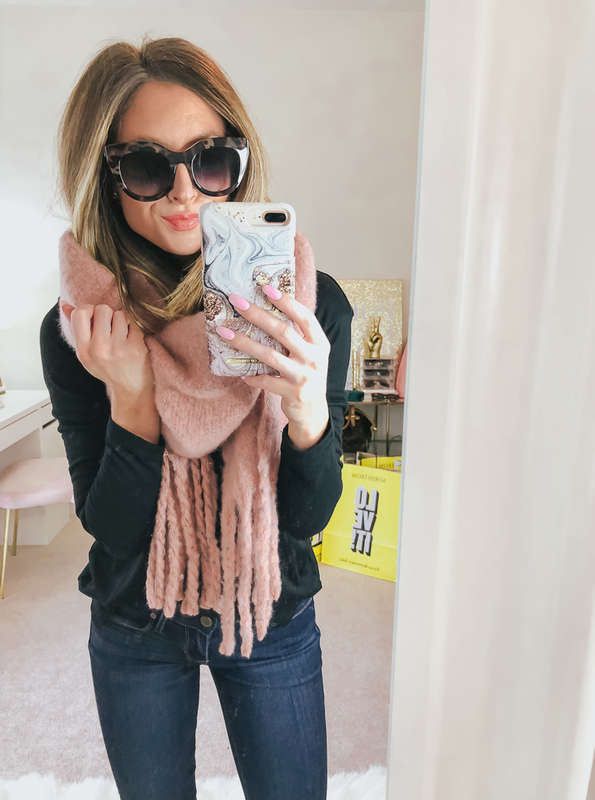 I have had so much fun shopping the 2018 Nordstrom Anniversary Sale for and with all of you and hope this try-on resource is helpful. I will have a second addition coming as soon as my additional packages make it to me (shipping has been slower than usual due to the number of orders being placed). I ended up ordering several pieces of athleisure and some more jeans and shoes to share! 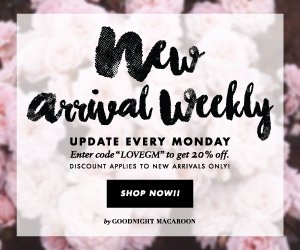 Happy Nordstrom Anniversary Sale 2018 (Officially)! I really like those AG ex-boyfriend jeans on you! I ordered the Lucky Brand bootie, hope I love them too!